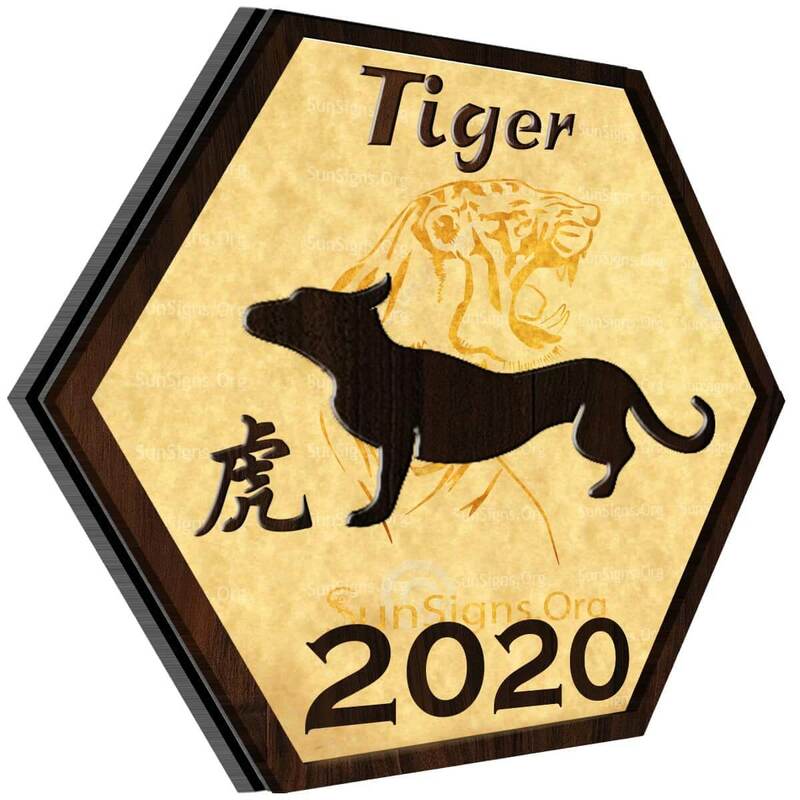 Home » Chinese Horoscopes 2020 » Tiger Horoscope 2020 – Free Astrology Predictions! Tiger horoscope 2020 predicts that your values will control your life this year. Or, to state it in another way, you will guide your life to live by what you believe in. This will bring many changes to your life. But it could also invite along new opportunities as well in this Chinese year of the White Metal Rat. Don’t just go with the flow this year, create your path! Orange or white, the third sign in the Chinese zodiac is the majestic tiger. The tiger in the wild has an authoritative and powerful air around it, much like the people who are born in the year of the tiger. Like the tiger, people born in this Chinese year are said to possess many of this animal’s traits. Chinese zodiac tiger are often strong, physically and mentally, ambitious and determined, charming and seductive. They are also intense, dominating, and instinctual. All of these traits perfectly shape the average person born in the year of the tiger, and all of these traits will also help to shape these people’s Chinese horoscopes for 2020. Is 2020 a good year for tiger in love? Love is in the air this year, and your heart and mind will be full of passion like never before. Things are about to get more exciting for you and your partner. If you are single, then be yourself and search for someone who shares many of your personality traits. Who knows? Maybe you’ll find love with another Tiger this year. Read about Chinese Tiger Tiger compatibility. When you look at your relationships, romantic or not, try to remember what caused past ones to fail. If it was something that you did, try to avoid that action this year. 2020 is all about succeeding in life and relationships; the last thing that you want to do is to make a rookie mistake again. You will make the best friends and partner with people who share your interests. Don’t hang out with people who make you irritable; you are too important to have to deal with that. Keep friends that inspire you, dump friends who do the opposite. Will the tiger get married in 2020? Will the tiger have a baby in 2020? There are chances for this and more. The tiger predictions 2020 foretell that your past efforts are sure to pay off this year at work! This is one area of your life that you don’t need to change to excel in. Keep doing what you’re doing, and you are sure to get that promotion or bonus that you have been dreaming of. Of course, if you are not comfortable with the job that you have, then it may be time for a change of scenery. Change your workplace, or your career, if that’s what is going to make you happy. In this year of the rat, there will also be changes in your finances this year. You will have the same expenses that you did last year. You are likely to be happier when spending money on others, rather than on yourself. Any financial problems that you do have will be solved easily, so don’t worry about it too much. Tiger, you will have a lot of energy, and you are likely to be a little more impulsive this year as well. This is exactly what you need to fuel yourself to make changes in your life! However, make sure that you don’t push yourself too much physically or else you could end up with an injury. Also, watch your diet, Tigers are especially prone to digestive and gastric health problems this year. Watch yourself, and you should stay healthy and safe in 2020. January 2020 will be a difficult month when you don’t know between right and wrong. February 2020 will continue to be a little troublesome. But with your kind heart, you will be able to overcome all problems. March 2020 is when you will go ahead in life due to teamwork. April 2020 might tempt you to make some investments that might go bad. So think twice! May 2020 is best spent with family. You might even improve relationships that have gone sour. June 2020 is a good month for travel for the Tiger zodiac sign. July 2020 will be pretty hectic, and you might hardly see your family. August 2020 is when your patience will play an essential role in helping you move ahead. September 2020 is a period when you will reap the fruits of your hard work and perseverance. October 2020 will be a favorable month for anything you put your mind to. November 2020 is when your personal life will take precedence over your career and business. December 2020 is an excellent time to work on new projects but be careful before trusting new people. The Tiger 2020 Feng Shui forecasts that you will come into some unexpected money this year. Tiger horoscope 2020 foretells that there will be many changes in your life this year. But it is you that will be making the changes – not fate or destiny. Do the things that will make you feel happy and successful. Don’t settle for second best. Be the person who you want to be, don’t let anyone else get in the way of this dream or your general happiness. If anything, 2020 Chinese rat year is a year to be you. Enjoy it! Previous Ox Horoscope 2020 – Free Astrology Predictions! Next Rabbit Horoscope 2020 – Free Astrology Predictions!